Pros: An unusual take on soldiers serving in the Helmand Province. Cons: The macabre horseplay between the soldiers in the early scenes seemed rather long and incongruous to the rest of the play. A play that’s interesting in parts, but would benefit from fleshing out some of the characters. Plays that directly address the presence of the West in Afghanistan are few and far between, understandably so given its political sensitivity. Almost Near tackles this topical subject in an unconventional way that doesn’t supply convenient answers. It begins abruptly with the sound of a bomb blast, at a volume designed to immediately draw the audience’s attention. This actually caused me to spill my beer, which goes to show how loud and startling it was! As well as the sprawled British soldiers on the ground, we are introduced to a British family at an earlier point in time: sculptor Louise (Kate Miles), her son Jeff (Andrew Gilbert) and her estranged husband Ed (Michael Sheldon). Jeff’s propensity to ’playfully’ shoot Louise and withdraw from her when she tries to show affection concerns her. Jeff’s only ‘friend’ is Buddy – someone his parents think is imaginary. 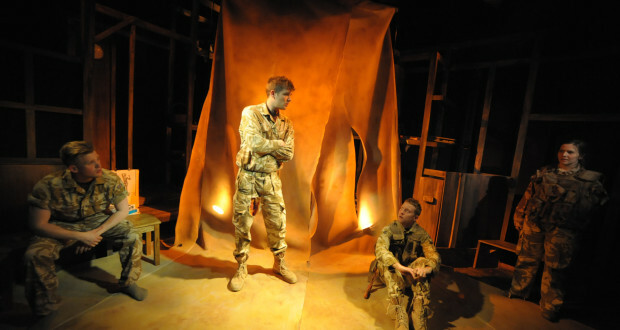 However when we see Buddy, we see that she has more than a passing resemblance to a distraught woman who has spoken to Ed as well as one of the inhabitants of the Helmand Province, leaving many questions for the audience regarding her significance. 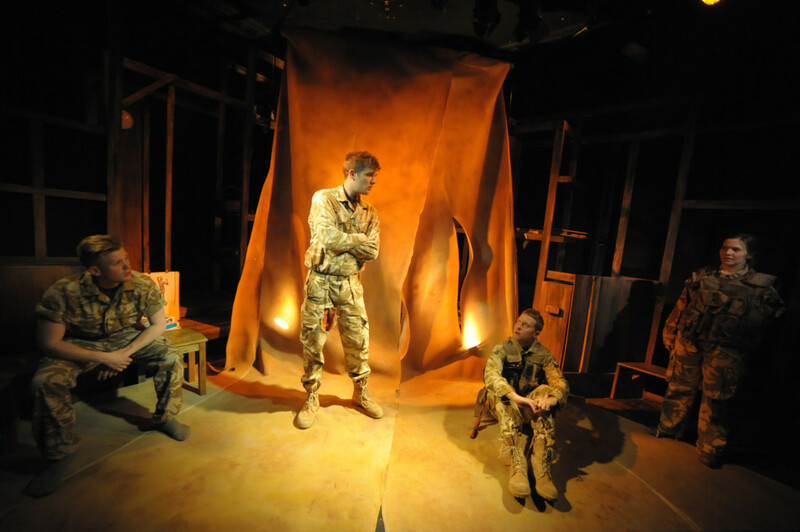 Given the abundance of male creatives that traditionally work on war-time narratives, it’s interesting that, like the movie The Hurt Locker, this play has not only a female director, but also a female playwright. The emotions of those in the theatre of operations (the correct term for the area of conflict and an apt description of the battlefield if ever there was one) or of those who know someone stationed in such an area are given particular attention. Louise, who uses a model (Adam Philips – ‘Princess’) to pose for her sculpture of a wounded soldier, is particularly aggrieved when he tells her that he plans to sign up and serve overseas. As a counterpoint to this, when the soldiers ‘awake’ after the bomb blast and realise that they’re now ghosts, Sergeant Natalie Jackson (played by Amy Loughton) does not share her comrades’ passive attitude to their predicament. She’s angry at being robbed of her life by people she came to help and both women exhibit greater insight than the men into the true nature of things. If I had to make one observation about the awakening scene, it’s that it didn’t feel emotionally true. The soldiers clearly exhibited fatal injuries, but instead of immediately addressing their wounds, there was drawn-out horseplay between the men – supposedly before they realised they were already dead. While I’d expect black humour to be used by soldiers as a way of coping with extreme circumstances, the slapstick violence and ignoring of their gruesome injuries robbed that potential moment of the gravitas of its verisimilitude. Aside from this, Almost Near succeeds abundantly in the use of sound to transport the audience to the battlefield. The stage mostly consists of a canvas sheet with tears to depict a makeshift tent. This being the case, Max Pappenheim’s sound design admirably creates the rest of Helmand Province for the audience, from military planes flying overhead to other nearby soldiers playing ACDC. In addition, the acquiescence of the men in their new role was also well-depicted, as they realise it’s the loved ones they’ve left behind who have the worse deal. As they let go of their former lives, their anxieties drift away like a hazy dream. To conclude, aspects of the play work well and even the areas which weren’t 100% clear were entertaining. The play would, however, benefit from fleshing out of some of the characters so that individual thoughts and motives were more apparent. It tantalisingly touches on important matters, but never to any degree of depth.